Where can I find leopard geckos for sale? Finding your new pet lizard won’t be too difficult. You can get geckos at pet stores, reptile shows, local breeders, and from mail order and online breeders. Pet stores are the easiest place to to find a gecko. Just about every town has a local pet store. If they don’t have geckos for sale, most are able to order them for you. The problem with pet stores is you don’t know where your leopard gecko came from or if its healthy. The gecko may be wild caught, or has been caged with wild caught geckos where it could have been exposed to parasites or disease. Pet stores also have a limited selection of animals and they tend to be more expensive. Reptile shows are an excellent place to find a leopard gecko. The selection of animals is large and diverse. You will find many color variations, geckos of all ages, and the prices are very competitive. Reptile shows have become quite popular and you should be able to find one within driving distance. The dealers at shows are usually very helpful and willing to talk about their animals and proper care. There are many online and mail order breeders available. You can find almost any coloration and variation of gecko you might want. Breeders are a great way to find a specific type of leopard gecko. There are a few drawbacks of ordering your lizard from a breeder. You are unable to inspect your gecko before purchase. The animal must be shipped which may cause injury or illness. The geckos are more expensive. Breeder prices are reasonable, but the cost of having the animal shipped via overnight delivery increases the cost. How do I pick out a leopard gecko? When you find a gecko for sale that you would like, make sure it will be a good pet. Check to see if it is healthy. The eyes should be bright and alert. The tail should be fat and round. The leopard gecko should look well fed. Find out what type of food the lizard prefers or is used to getting. Find out the age of the gecko. It should be at least six weeks old. How much do leopard geckos cost? The average price range is from $25 to $75. 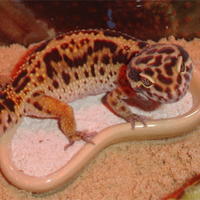 The cost varies based upon the age, type, variation, and coloring of leopard geckos. Where you purchase the lizard and the time of year is also a factor.